Thanks for your company today as Celtic and Aberdeen rose to the top of the Premiership - just as they did last season. Join us again for a near full programme of games in midweek, starting on Tuesday with the Dundee derby at Tannadice and St Johnstone hosting Ross County. "I thought the players were excellent and it was a top-class performance. "We asked them to treat this with the same important as the European game in midweek. "It took us a while to get the first goal, but it was a great goal and well worth waiting for. "I thought we were pretty dominant throughout. "In the last 20 minutes, some of them were running on empty, but we had that 2-0 cushion." Come on Mr McInnes. I have a hungry cat to feed back home! "We got a response and were certainly more aggressive. We didn't lose as many tackles. "But we didn't get forward enough and get up in support of Kris Boyd on the break in the first half. "I felt the game plan was working until we lost a scrappy goal just before half time. "We had a few chances to get back into the game, but we've got to take them at the top level. "We were terrible last week, but the boys showed their fighting qualities today." We are waiting for the reactions from the two managers, Derek McInnes and Gary Locke. LN - a very very unhappy Dons fan: "Just arrived home after not getting into Pittodrie for the Aberdeen game. On what planet does a Dons v Killie game need to be all-ticket? Learned of new policy at the turnstile. Walked round to the ticket office and, judging by the length of the queue, we might have got in in time to see the second half. We left. First time in 40 years I have missed a home game when fit and free to go. Don't know if I will be back." Scott Hamilton: "Why the surprise about the paucity of Kris Boyd's play? Was no-one watching last year when he was absolutely hopeless for Rangers? A ridiculous signing by Kilmarnock." "Graeme Shinnie's finish was one that any top striker in Europe would have been happy with and there was no doubt where the points were going once the second goal went in. Gary Locke can take consolation from the fact that, when he did take the shackles off, they looked more like a team, but it was his tactics that caused problems in the first half." Aberdeen join Celtic and Hearts at the top of the Scottish Premiership with maximum points from the opening two games after an easy win over lacklustre Kilmarnock. "Will Gary Locke have learned that they can't play Kris Boyd if they don't get people up in support of him? They haven't looked too exposed when they have taken the shackles off and been more positive." Kilmarnock defender Mark Connolly is next to go into the referee's book for a foul. Fadi Audah: "Very early days, but I see a long hard season ahead for Killie!" I think lots of people will agree with you. David Goodwillie is sent on by Aberdeen manager Derek McInnes in place on Niall McGinn. Andrew Considine makes a good run and cross and his fellow full-back, Shay Logan, connects to force Killie keeper Jamie MacDonald into another save. "Greg Kiltie has made a good impression since he came on and has been involved in all the good play Kilmarnock have had." "The shackles seem to have been taken off for Kilmarnock and they seem to be enjoying it." Greg Kiltie rides a challenge from Andrew Considine and his cross finds the head of Kris Boyd, but the striker's header from six yards goes wide. The game has opened up and Cammy Smith just fails to get on the end of a ball across the face of the Kilmarnock goal. Shay Logan forces Kilmarnock goalkeeper Jamie MacDonald into a fine save with a blistering long-range drive. Kilmarnock also make a change, with forward Greg Kiltie replacing Rory McKenzie. Aberdeen make two changes, with Jonny Hayes and Kenny McLean, who passed a fitness test to start, being replaced with Andrew Considine and Cammy Smith. "It is a long, long way back for Kilmarnock, but they haven't given up and are pushing men forward. However, on the evidence here Aberdeen are the only side likely to add to the scoring." Kilmarnock manager Gary Locke has brought on striker Josh Magennis to replace defender Mark O'Hara. A positive move, but is it too little too late and perhaps even suicidal as it could give the Dons more space to attack? Darryl Westlake has to make a brave header as Aberdeen press forward and Kenny McLean just fails to extend the home side's lead. Ross Brechin: "Graeme Shinnie opening his Aberdeen scoring account on his home league debut in style this afternoon." Dougie Kinnear: "Boyd is continually complaining to the ref for no reason. I can only imagine that Boyd's half-time pie order was incorrect!" An incorrect pie? A meat one instead of a custard one? Adam Rooney side-foots into the net, sending goalkeeper Jamie MacDonald the wrong way from the penalty spot to extend Aberdeen's lead. Willo Flood is taken down and the Dons have a penalty. First chance for Kilmarnock and a delightful cross from Kallum Higginbotham finds Scott Robinson stealing in unmarked, but the former Hearts midfielder's header is off target. Two of Gary Locke's summer signings threaten Aberdeen! Tynecastle1874: "Seems Hearts were right to get rid of Gary Locke as manager and bring Craig Levein and Robbie Neilson in." Even though we are only two games into the season, Kilmarnock look to be in trouble: rather unimaginative summer signings and, at present, heading for a second straight defeat. Rory McKenzie is the next Kilmarnock player to go into the referee's book for a clumsy challenge. We're off again at Pittodrie. Will it continue to be the second one-sided game of the day in the Scottish Premiership? Kris Boyd, the all-time top scorer in the Scottish Premier League, is getting pelters on BBC Radio Scotland from Willie Miller and Billy Stark for "offering nothing" up front for Kilmarnock. The ex-Scotland striker hardly started for Rangers in the Championship last season and we are maybe seeing why. "The game has panned out the way Kilmarnock probably envisaged it, doing a lot of defending. We can sit here and say they have to be more ambitious, but they don't want to suffer another heavy defeat after last week and it is a dilemma for Gary Locke." "It was played at a low tempo to start with, but Aberdeen grew into it and dominated in terms of possession and chances. A sublime goal and finish from Graeme Shinnie and they are absolutely miles ahead of Kilmarnock." "The minute you don't have the 0-0 to hold on to, it becomes hard for Kilmarnock. They don't have an out ball and Kris Boyd is not going to give them that." Graeme Shinnie scores his first goal since joining Aberdeen from Inverness Caledonian Thistle. Jonny Hayes rides a poor challenge by Darryl Westlake and the ball breaks to Shinnie, who fires powerfully into the top corner. Ash Taylor fires from all of 30 yards and it flashes wide of a Kilmarnock post. The Dons defender seems to be getting a bit frustrated. Kilmarnock have rarely threatened, but it needs a fine challenge by Ash Taylor to thwart Kallum Higginbotham. The visiting striker finished the season without a goal in his last 29 games for Partick Thistle and looked to lack confidence there. A superb reaction save from Jamie MacDonald as he shows strong hands to push away a powerful header from Shay Logan. The defender should have opened the scoring there for Aberdeen. Kilmarnock's Kallum Higginbotham is next in the book as he takes the legs away from Niall McGinn. Pretty cynical and the forward is likely to see red if he has another bad foul. Just ahead of that latest effort, Kilmarnock defender Darryl Westlake was first in the referee's book for a second clumsy challenge of the match on Jonny Hayes. Kilmarnock goalkeeper Jamie MacDonald gathers at the second attempt following a drive from Kenny McLean. Dougie Kinnear: "Lustig 'doesn't know the rules'. Must be difficult when they are applied differently to Celtic & the rest of us!" A reference there to the Celtic defender's earlier comments about whether his hand ball against Partick Thistle was a penalty. Aberdeen's full-backs are starting rampage forward and Graeme Shinnie's cross finds Shay Logan at the far post, but the header is off target. Aberdeen must have been listening to former Dons player and manager Willie Miller's comments on the radio as they are starting to up that tempo. Killie fail to defend the corner properly and Paul Quinn's header strikes the crossbar. Niall McGinn drives towards the Kilmarnock penalty box and unleashes a drive that is turned round the post by goalkeeper Jamie MacDonald. It is all very subdued at Pittodrie, with Aberdeen looking a bit like they are suffering from a hangover from their Europa League aggregate defeat by Kairat. "Aberdeen have got to try to up the temp. They are playing a team that are coming here on the back of a bad defeat and they have allowed them to settle into the game." Jonny Hayes has an early shot at goal as Killie pack their penalty area nervously, but the effort goes wide. The sun is shining at Pittodrie as the two sides come out on to the pitch. Kilmarnock manager Gary Locke also makes three changes from the side that lost 4-0 to Dundee. Mark O'Hara, Lee Ashcroft and Rory McKenzie come into the side in place of Stuart Findlay, Chris Johnston and Josh Magennis. 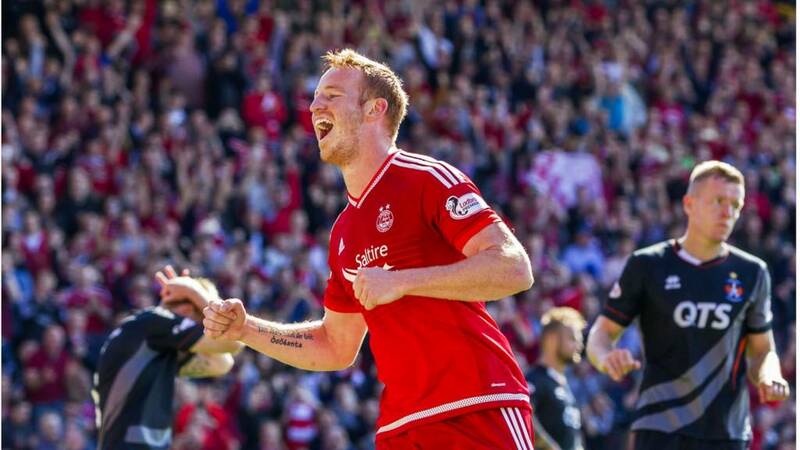 Aberdeen make three changes, with Paul Quinn, Willo Flood and Adam Rooney coming in for Andrew Considine, Peter Pawlett and David Goodwillie after their exit from the Europa League qualifiers. "We probably did not do enough. Celtic played in second or third gear for most of the game. "I think it would be better if it is hand ball then it is a penalty, but we take it on the chin and move on. "I know we are a lot better than that. Our better players did not do enough." "The first 35 minutes was some of the best we have played this season, but we got a little tired I think. "We got a little sloppy as it was a little too easy. "I don't know if they had a chance - maybe one near the end. "Stuart Armstrong was a stiffness in the groin, so we weren't taking any chances. "We wanted to start with him, but that was not a wise decision - but no harm was done." Aberdeen: Ward, Logan, Taylor, Quinn, Shinnie, Flood, Jack, McGinn, McLean, Hayes, Rooney. Subs: Considine, Smith, Robson, Goodwillie, Brown, Storie, Wright. Kilmarnock: MacDonald, Westlake, O'Hara, Connolly, Ashcroft, Smith, Higginbotham, Hamill, Robinson, McKenzie, Boyd. Subs: Barbour, Findlay, Splaine, Kiltie, Magennis, McKay, Hawkshaw. "We are looking for a big improvement today and I'm sure we'll get that. We know if we play to our capabilities we can get a result. This is where players should be striving to play. There will be a big crowd here again." "Kilmarnock are a team desperate to make amends for last week. Hopefully we show that determination to impose ourselves from the first whistle." "When you put so much into it [the European exit by Kairat Almaty], you want the reward. You've just got to dust yourself down and focus on the next game. It is a missed opportunity, but we're out and that's how it is. We now focus on the league. The new lads have settled in fine. We've had seven competitive games and we have managed to play different systems." "The referee must have seen it touch my hand, but I don't know the rules and he has not given a penalty. "It is nice to come here and take three points. "We started well, playing some excellent stuff for the first 30 minutes, but after that we became a bit sloppy." Attention now turns to Pittodrie, where Aberdeen, expected to Celtic's closest challengers this season, hosting Kilmarnock, who suffered a shock to the system with an opening 4-0 hammering at home to Dundee. Celtic have in recent seasons been most likely to stumble on the back of a European game, but not this time. They brushed aside a Thistle side who had one shot on target all afternoon. Celtic secure a second successive 2-0 win to join Hearts at the top of the Premiership table with two wins out of two. Celtic win a free-kick after a foul by Thistle's star man, Liam Lindsay (well, he has a great name), but Leigh Griffith's curling drive over the wall is saved. Mathias Pogba should have scored a minute earlier, but the striker has made a difference for Thistle and this time he fires a low drive from just outside the penalty box that is smothered by Craig Gordon - the first time the Celtic has had to make a save. A great chance for Thistle to come back into the game as David Amoo powers towards the by-line and finds Mathias Pogba with his low cut-back, but the striker's first-time effort from 12 yards goes just wide. Mathias Pogba is a lonely soul up front for Thistle and has to go on his own on this occasion and his wild long-range drive is well over the crossbar. "It's not as good as the first 35 minutes, but Celtic are just cruising." Gary Fraser comes on for Sean Welsh in another change to Thistle's midfield. Stephen Hay: "Every player and fan should learn Tom Rogic's story. Nike 'The Chance' winner & long term injuries. Truly inspiring." A reference there to the competition the Australian won in 2011 alongside seven other young footballers among 75,000 other hopefuls around the world. Callum Booth looks to make up for his mistake at the second goal with a fine curling low cross into the Celtic penalty box. Unfortunately for the home side, Virgil van Dijk is on hand to thump clear and deny Mathias Pogba a chance of a debut goal. Walking wounded Ryan Stevenson has been replaced in Thistle's midfield, his replacement being one-time Liverpool man David Amoo, more recently of Carlisle United. Tomas Cerny does well to prevent Celtic extending their lead as he beats away a powerful long drive from Leigh Griffiths. That came shortly after scorer Tom Rogic was replaced with Gary Mackay-Steven. Poor defending by Thistle as they are undone by a long ball over the top of their central defenders. Callum Booth hesitates as he is challenged by Kris Commons, but the Celtic midfielder keeps going and chips the ball over goalkeeper Tomas Cerny. Midfielder Gary Mackay-Steven is about to come on for Celtic. Thistle have a bank of five behind a bank of four as Celtic string passes from one side of the pitch to another in search of the space that is being denied them. Thistle are at least stringing a few passes together and Callum Booth fires their first shot of the afternoon. However, the full-back's effort is well wide of the far post from the edge of the penalty area. "Just now, Celtic look to be toiling to get to the same level of intensity they had in the first half." Leigh Griffiths leaves young Thistle defender Jack Hendry on the deck after a shoulder into the 20-year-old's face. Thistle bring on Mathias Pogba, the former Crawley Town striker and older brother of Juventus midfielder Paul and who was signed this week after impressing on trial. Steven Lawless is the man coming off, with Ryan Stevenson dropping back into midfield. Celtic start the second half and are immediately in passing flow, keeping the ball off hosts who were rarely in possession in the first 45. "Celtic have had a terrific intensity about them, but some of their passing has been sloppy and the accuracy has been missing. But John Collins said they can afford to be sloppy and there's a sense that, if they miss a chance, there will be another one. Thistle have made a rod for their own back by giving the ball away cheaply, but they showed in the last five minutes there's still some spirit in them." It has been all Celtic at Firhill this afternoon. However, they only have one goal for all their pressure and that is about the only positive the home side can take from that first 45 minutes. "Over the last five minutes, Celtic's tempo has gone down a bit and you wonder if they can keep it up after their European travels. That is what Alan Archibald will be hoping." Stephen Hay: "This could be the best game Izaguirre has had in a Celtic jersey. winning tackles, passing smartly, still can't cross it." A big shout for a penalty from the home side as the ball is volleyed against the arm of Celtic defender Mikael Lustig by David Wilson. It was definitely a hand ball, but it is obviously accidental. Wow, Thistle have just been in Celtic's penalty area! However, a weaving run by Steven Lawless is ended by a lazy leg from Nir Bitton that restores possession to visitors who are strolling through this. Celtic defender Virgil van Dijk shows his quality by a little nutmeg that leaves Liam Lindsay beaten, but the Dutchman fires into the side netting. Leigh Griffiths fires wildly over under pressure from his marker as the Celtic striker races behind the home defence. That is Tom Rogic's first goal for Celtic in his first outing for the Glasgow side since coming on as a substitute in a 3-0 defeat by AC Milan in November 2013. Tom Rogic shows a nice bit of skill, the midfielder finding the far corner of the net with a little flick with his heel from eight yards after an equally clever knock down from Leigh Griffiths. Thistle are struggling to remain on level terms as Tomas Cerny makes a point-blank block to deny Leigh Griffiths then Virgil van Dijk's low long-range drive strikes the outside of the goalkeeper's post. Celtic make an early substitution, with Stuart Armstrong, who had been feeling a little fatigued after the long midweek European trip, coming off and being replaced with Callum McGregor. Neilo: "Great to see Rogic getting his game. He could be a good player for us if given a chance." Another comfortable save for Tomas Cerny, this time at his left-hand post after a dipping free-kick over the defensive wall by Celtic striker Leigh Griffiths. Kris Commons weaves himself some space and he fires a low drive that Tomas Cerny holds fairly comfortably. Ryan Stephenson is back on the pitch sporting the Terry Butcher-style white bandage after a few boos alerted the referee John Beaton to his pleas to return. Ryan Stevenson, who was substituted early last week after Frederick Frans was sent off against Ross County, is off the pitch with blood pouring from a head wound. The Thistle forward had been predicting a physical battle with Van Dijk and that's exactly how it has proved already. The game is being held up as Thistle's Ryan Stevenson and Celtic's Virgil van Dijk have a clash of heads. First chance for Celtic as Leigh Griffiths rises above his marker at the back post to bullet a header over the crossbar from 10 yards following a fine Emilio Izaguirre cross. Thistle kick off and immediately lump the ball up the park and out for a throw in. I hope that is not a taste of tactics - and the quality of play - to come. "I can't see Partick Thistle having anything to worry Celtic. For Alan Archibald's side, it will be a case of damage limitation." The teams are out on the pitch for the first Glasgow derby of the season. There seems to be a bit of concern for Kenny McLean up at Aberdeen. Ahead of the 3pm kick-off, the midfielder has been out warming up with physio at Pittodrie. "When Celtic come to us, they don't usually make many changes. We'll be ready for them, hopefully. "Mathias Pogba is a bit short of fitness. He'll get on the pitch at some point. "He's a big presence, he's 6ft-plus. "We have every confidence in the two young centre-halves. "Last year was a bit of a non-event against Celtic. Hopefully today we can get a foothold against Celtic." It is a big test for Thistle's young central defenders, with Liam Lindsay, aged 19, being joined by Jack Hendry, who is only a year older because of Frederick Frans' suspension. Thistle leave new signing Mathias Pogba on the bench as the striker is lacking match fitness. Central defender Frederick Frans is banned for Thistle following his red card against Hamilton Accies last week, while winger David Amoo and striker Kris Doolan drop to the bench. David Wilson and Jack Hendry are promoted from the subs' bench, with the latter having replaced Frans in central defence against Ross County, while Steven Lawless comes directly into the starting line-up after serving a suspension. Thistle manager Alan Archbald faces a psychological barrier. His side failed to score in four defeats by Celtic last season, the last time they breached their Glasgow rivals' defence being in a 5-1 home defeat in March 2014. The Firhill side have suffered 13 straight defeats by the Parkhead outfit since a 1-1 draw at Celtic Park in November 2002. That was the only time they have avoided defeat in 18 games since their last victory - 3-1 at Celtic Park in May 1995. Thistle's last win at Firhill was in January 1994. Partick Thistle: Cerny, Miller, Welsh, Booth, Osman, Bannigan, Stevenson, Lawless, Lindsay, Wilson, Hendry. Subs: Scully, Seaborne, Amoo, Doolan, McDaid, Fraser, Pogba. Celtic: Gordon; Lustig, Boyata, van Dijk, Izaguirre; Bitton, Johansen; Commons, Rogic, Armstrong; Griffiths. Subs: Bailly, Ambrose, Scepovic, Mackay-Steven, Janko, McGregor, Henderson. "Tom Rogic should have played before because he has been good in training and I know he is going to be a good player for us. "We want to win games to keep the momentum going and play out best team. "We have a lot of players who ran a lot on Wednesday. "I think we are getting better with every game now." Celtic make three changes from their Champions League qualifying win over Qarabag, with Tom Rogic starting in place of injured captain Scott Brown, Kris Commons joining him in midfield in place of Gary Mackay-Steven and Leigh Griffiths back up front in place of the suspended Nadir Ciftci. Give us your thoughts on those, any other burning issues in Scottish football this week, or today's events at Celtic Park and Pittodrie. BBC Scotland Facebook page, or text on 80295.
quoted in the papers today saying that he is on the social media site to keep an eye on his players and make sure they are behaving themselves. Might he be better off sending his scouts out into the Merchant City on a Saturday night? Or bugging their homes in Bothwell or wherever? has apparently suggested that this will be the last time he faces Virgil van Dijk in a Glasgow derby as he expects the Dutch defender to be sold whether or not Celtic reach the Champions League group stage. Although Celtic have denied they have received a reported £8m offer from Southampton, one newspaper is suggesting that Everton will join their English Premier League rivals in pursuit of the 24-year-old should they be forced to sell John Stones before the end of the transfer window. quoted in the Sunday newspapers as saying all their Premiership rivals are "not clever enough or quick enough thinkers" to mount a title challenge. Welcome to the second Sunday of Scottish Premiership football this season and already last season's top two have a chance to go back there as reigning champions Celtic, who travel to face Partick Thistle, and last season's runners-up, Aberdeen, who host Kilmarnock, can join Hearts on six points from two games should they win this afternoon.